The site of the School of Electric Lighting. A view looking along the path towards Fort Gilkicker. East of the GAFIRS headquarters is a path along the Bay to Fort Gilkicker. Halfway along this path it climbs onto a small plateau where pieces of concrete and brick can be seen embedded into the ground. This was once a hugely important site. It started life as a construction yard when Mr White, a Gosport contractor owned it. Its proximity to Stokes Bay pier was an important factor in it being used for the construction of the massive Solent forts that can be seen if you look out to sea from Gilkicker Point. 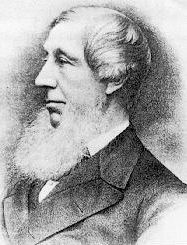 John Towlerton Leather, a civil engineer of great renown, was offered and accepted the main contract in 1861 for building the Solent forts and all the arrangements to construct them. This also included making concrete blocks, provision of steam engines, steam cranes, pile drivers, the erection of a shipping pier, special barges for transport and circular stages for the construction work. 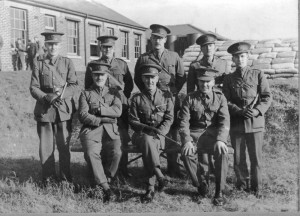 This was all to be done under the general supervision of the Royal Engineers Department. A large complex of buildings was established at White’s Stokes Bay yard. Here thousands on concrete blocks that were needed in the construction were made. At the yard was a cement mill, cement stores, blacksmiths, with a village of workshops. Other buildings were constructed to support all the work including a ‘Shanty Town’ where many of the workmen lived. It became known as ‘Leather Town’. 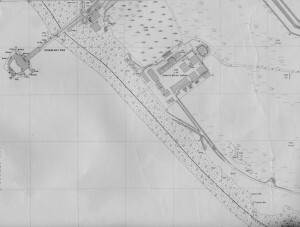 The works had railway lines crossing the site in all directions and also a junction with the Stokes Bay Railway company line. Overhead railways were also built, worked by great and powerful steam cranes for moving great blocks of stone. A stout pier was built out into Stokes Bay from the southern edge of the works, with a double railway line and a steam crane on it. Portland and Penhryn Stone was delivered to Stokes Bay by sea and Runcorn stone arrived at the site by rail. The crane on the pier not only unloaded the rough cut stone onto the site, but also delivered finished stone from site to lighters and barges which were pulled out to the fort building site by steam tugs. Each stone or concrete block moved weighed between 3 to 8 tons. On a part of the site, a section of ground was cemented over and laid out as a “Drawing board”. Shaped and trimmed stones were laid out here as they would be underwater, then numbered and marked in coloured lines. Using these numbers and the coloured lines, the divers were then able to fix them in their correct place on the fort site. Tugs moved the lighters (large barges) heavily laden with stone out to the first site from Stokes Bay, to build the Horse Sand Fort, No Man’s Land Fort and Spitbank (Spitsand) Fort. In 1863 a contractor, Jaz Goslin was given the contract to build Fort Gilkicker’s foundations, close by to this site; he started but towards the end of 1863 after six months work his company failed. 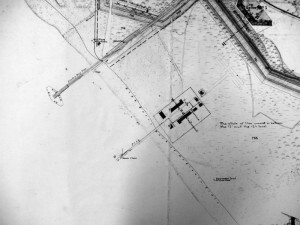 The War Office approached John Leather while he was building the Solent forts and asked him if would complete Fort Gilkicker, he agreed and work started in June 1865. 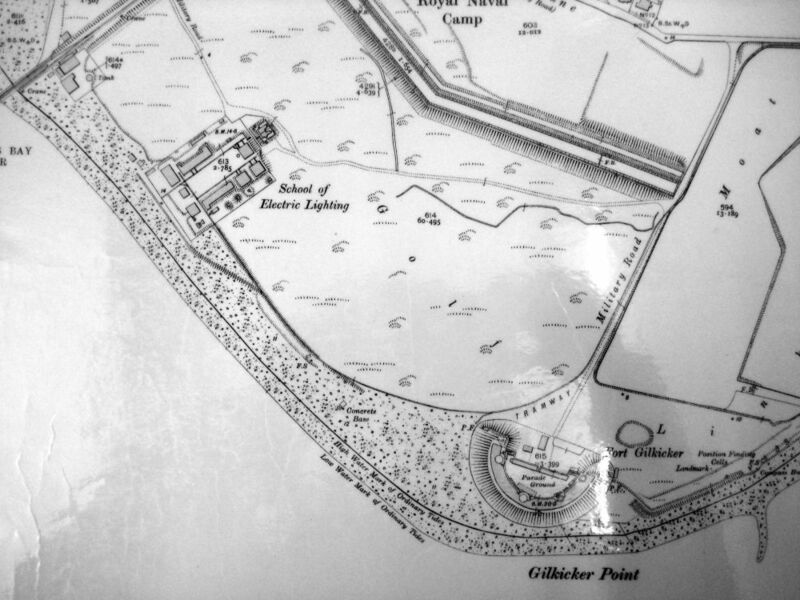 By 1869 the the fort was nearly finished and described in a Government report as “skilfully built, both for permanency and for resisting power. There have been no failures of any sort”. The fort was finally completed in 1871. Although this is not taken at Stokes Bay, this photograph shows a typical Submarine Mining Establishment in the 1890s with the same equipment an facilities that would have been at Stokes Bay. 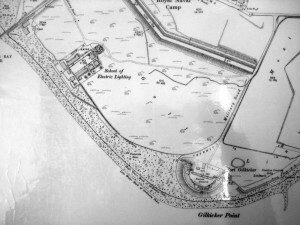 On the completion of the Spithead Forts Leather moved out of the yard and the Royal Engineers took over use of the site. Submarine mining work began at Gosport in 1873 with a test-room in Fort Gilkicker and an old shed at Stokes Bay, formerly used by the contractor that built the Spithead forts. In 1875 orders were given for the headquarters and a section of the 33d (Torpedo) Company of the Royal Engineers to proceed from the torpedo-ship Hood to Fort Monckton for submarine mining operations, replacing the 4th (Torpedo) Company already at the Fort. 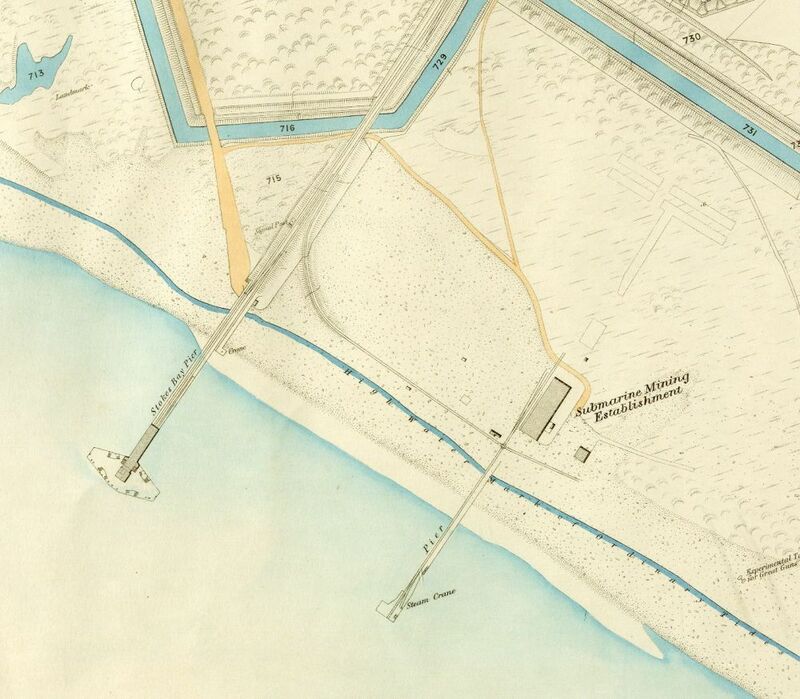 The Hampshire Telegraph reported on 12 April 1885 that large quantities of creosoted timber, some in baulks 43ft in length, had been arriving from London and were carried to Stokes Bay in the neighbourhood of Fort Gilkicker for the construction of a new pier to be built there in connection with the Royal Engineers’ submarine mining School, the headquarters of which will be centred in this locality. The Stokes Bay Submarine Mining Establishment was the centre of Submarine Mining training. Royal Engineers were trained as electricians and as divers. They learned the safe handling of explosives and the use of defensive mines. Submarine mines were laid and tested off Fort Gilkicker in Stokes Bay. The establishment at Stokes Bay consisted of a series of buildings around the pier. The stores and workshops were on one side, the classrooms and offices on another whilst the mine store and loading shed occupied a third side. On the seaward side was the pier with cable tanks. The school opened in 1892 as an experimental works with detachments of officers and men sent yearly from Chatham for a rough-water class. The establishment was ideal for mining work all year round and being close to Portsmouth it put the school “in touch with the best naval and military opinion”. The Royal Engineers built a narrow gauge military railway, for steam and sail driven trains from the Stokes Bay Establishment to Fort Monckton and on to Fort Blockhouse. 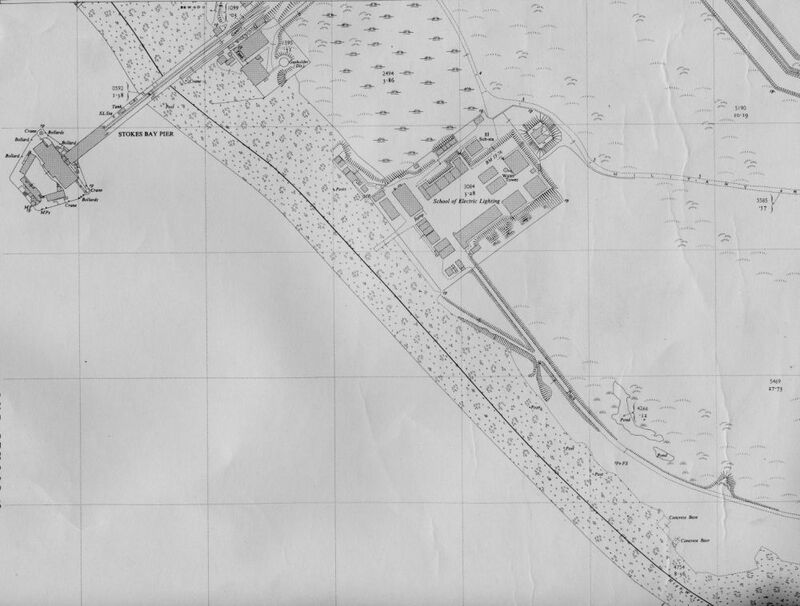 It ran eastwards from the Establishment and turned north crossing the access road to Gilkicker and on north of Fort Monckton, then along Haslar sea wall to Fort Blockhouse. The embankments for this railway can still be seen. The Submarine Mining Establishment in1890, on the site of Leather’s Yard. The Submarine Mining Establishment in 1892. One plan shows it as the School of Electric Lighting (Searchlights) but all subsequent plans show it as The School of Electric Lighting. 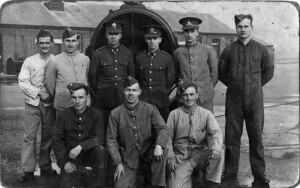 The submarine miners at Fort Monckton were transferred to other Royal Engineer units. 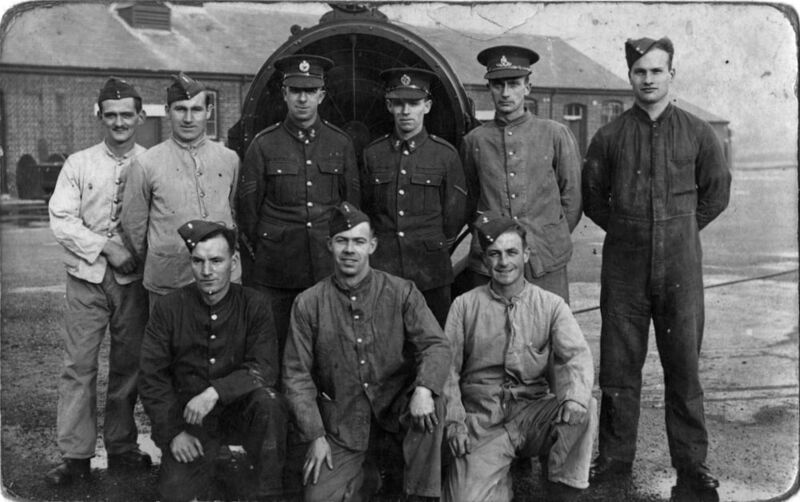 The Royal Engineer School of Electric Lighting moved into the buildings at Stokes Bay to train in the use of electric searchlights for defensive purposes. One plan shows it as the School of Electric Lighting (Searchlights) but all subsequent plans show it as The School of Electric Lighting. No.6 Electric Light Company was based at Stokes Bay, Gosport. In 1924 the 22 Fortress Company R.E. occupied Fort Monckton and the workshops at Stokes Bay were still in use. In 1932 a memorandum accompanying the Army Estimates stated that it had been decided to entrust the responsibility for manning the whole of the Coast Defences of the UK to the Territorial Army. Out of the Engineer personnel withdrawn a new Regular Fortress Company was formed for duty at Portsmouth and was used to operate part of the Portsmouth searchlights and to keep abreast of technical developments in lights for the benefit of the whole coastal service. This arrangement reduced the School of Electric Lighting at Stokes Bay to purely defence work in conjunction with the new Fortress Company. The School of Electric Lighting can be seen in the background of this photograph taken from Stokes Bay pier. Extreme right in the distance is Fort Gilkicker. The School of Electric Lighting continued to be used by the R.E. until the 1950s and perhaps beyond. The buildings of the School were finally demolished by civilian contractors under contract to the Ministry of Defence prior to March 1974 when Gosport Borough Council acquired the land from the M.O.D. and little remains apart from a few blocks of concrete among the grass and shingle on the beach. As you walk over this site ponder on the great significance that it has in the development of the military defences of the U.K. It is sad that so much happened here but little was done to record the site before it was completely demolished in the 1970s.